Writing about golf last week triggered a memory sometime back during one of my trips back home to Singapore. I was visiting a friend at his place when he eagerly dragged me to the garage to show off his latest set of clubs. To start, it was an expensive brand loaded with the latest technological bells and whistles and the price tag was further bumped up with a custom-fitting session with a pro and all the video cameras and computer analysis thingamajits. I was floored when he told me the final price. Let's just say that the set of clubs was not in the low 4-figures. So I asked how is he shooting on the fairway with this set of clubs. "Oh, I am still at the driving range. I am getting about 100m with my 7-irons now." He said as I was floored a second time. 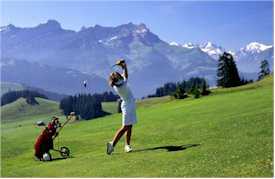 Yes, golf may not be the cheapest game around, especially in Singapore but it is certainly not a game that would put you into financial hardship, that is if you plan your money properly. So, if you are not like this friend of mine who has money to throw around and you are interested to figure out how to get the most bang out of your buck, read on. First - Your get up. Golf shoes and golf gloves are your basic necessities. Decent collared polo-Ts and pants/bermudas (belted, no elastic waistband and no jeans) are a requirement. Baseball caps or visors are optional since driving ranges, where you would start learning golf, are mostly indoors. The fierce looking David Duval Oakleys can wait. Don't go around spending every single dime before you even swing your first club. Besides, it is going to be lagi malu for you, if you dressed up fierce fierce and you..... air balled. Second - Your Coach / Pro. Try to get a coach via friend's recommendation i.e. these coaches have been tried and tested. Do not stupid stupid just sign up for "package" then just straight away report for lesson. Instead, make an appointment with the coach and spend some time talking to him/her. There are the chatty types and there are the serious no-nonsense types that you thought perhaps he/she was from East Germany during the Cold War era (You hit a bad shot! You must be punished! Off to the Siberian front!). Get a feel (figuratively speaking, of course!) of this coach and see if you are able to work well with him/her. Those with a good rapport tend to learn faster and you can understand him/her better and he/she would be more motivated to teach you. Avoid the overly chatty one coz you are not paying him/her an hourly rate to gossip. Spread out your lessons and there is no such thing as a crash course. I came across this one particular friend (who at that time was a total golf zero), some time back, who wanted to pencil in 10 lessons in the hope that he would be able to play in his company's corporate golf tournament (which was 30 days away) coz he bragged to his entire office that he was an avid golfer. Despite my nays, he stubbornly went ahead and plonked down the money for the crash course. As expected, he didn't show up for the tournament by feigning illness that day. Here's the thing. It is one thing that this friend was stupid but my bigger beef was the integrity of the coach who agreed to take him on (and his money) and promised him golf proficiency at the end of the 10 lessons. Click here for Budget Golf Series - Part 2 of 5. Cheryl: Welcome to the blog! Glad to know you enjoyed reading my crap. May cause permanent head damage. You have been warned! Anyway, do read on as to what I have to say about golf. Who knows this would inspire you to take up the sport?